Looking for a FREE teacher resource? 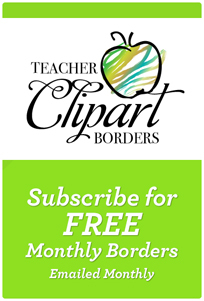 Subscribe to our monthly email newsletter that contains a free border! You may want to consider subscribing to our website for access to hundreds of high-quality teaching resources! You will have unlimited downloads on Teacher Clipart Borders. These creative writing tools are updated daily! All files will be available for instant download as Microsoft Word Templates. This means you can add content if you so wish, or just print. All documents are print ready, but be sure to check your print preview before printing to make any needed adjustments. After checkout and payment browse the website and download any of the resources you need! All TeacherClipartBorders.com artwork files are copyright protected. It is strictly prohibited to distribute any digital files beyond personal use.